I hope you all have been well. It's winter time here in Australia at the moment & rather chilly. Everyone in our house seems to have a cold :(. But that's not why you are here :). I want to share some of the amazing cards entered into this month's challenge here. 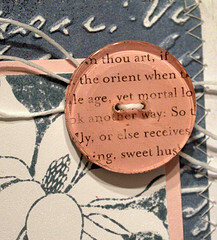 This first card is by Sue & you can check out her flickrstream here. 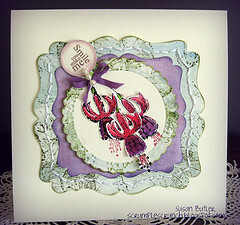 I always love seeing what Sue comes up with, her cards are always so elegant don't you think? The very lovely Dawn (one of our wonderful moderators) made this cute card. It makes me smile everytime. You can visit here for more wonderful creations. 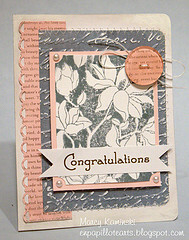 This next card is by Marcy & she has kindly included a close up of the recycled paper that she used on her button. What a great idea :). 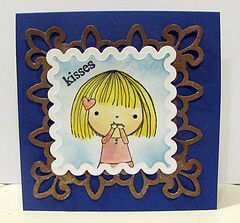 Please visit Marcy here to see more of her wonderful cards. This card is soooooooooo sweet! 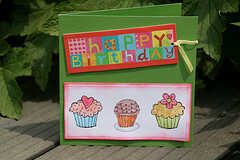 I love the way Ettevyke has recycled the tag & her cupcakes look so yummy. Please stop by Ettevyke's flickrstream here to see more beautiful cards. May has ended and June has come so it is time to, select a winner! And may I say that you all outdid yourselves with this one! I counted 27 beautiful entries, seeing all the different styles was so fun! Also come join Arlene this month, to recycle re-purpose and re-use!